NEWS RELEASE SAULT STE. MARIE AIRPORT DEVELOPMENT CORPORATION **************************** Sault Ste. 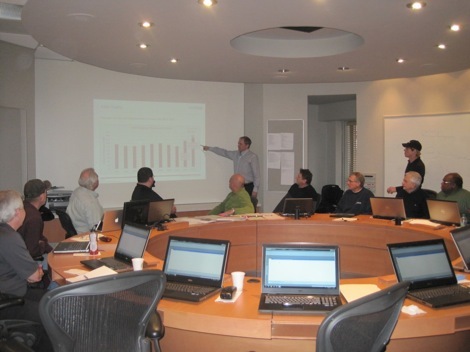 Marie Airport Development Corporation carries out strategic planning session SAULT STE. SAULT STE. MARIE - During a recent strategy session held on January 18 and 19, 2013, the Board of Directors and management staff of the Sault Ste. Marie Airport Development Corporation (SSMADC) carried out a strategic planning exercise covering areas of operating/capital expenditures, investment and business development opportunities within the next five years. The board was assisted by Paul Ouimet, executive vice-president of InterVistas Consulting a multi-disciplined aviation, transportation and tourism firm. Increase to the passenger traffic through the airport saw a historical record since SSMADC ownership began in 1998 shattered with major increase from a record low of 121,991 in 2010 to 187,554 in 2012, a 53.7 percent improvement. This could not have been achieved without the support of the community, the introduction of additional airlines (domestic and seasonal), which resulted in an improved service in travel times to various destinations along with offering competitive prices. The Sault Ste. Marie Airport also saw record aircraft traffic in 2012 with 65,941 movements an increase of 37.6 percent from previous year’s total of 49,767. This growth in aircraft movements is attributed to many things including increased airline movements from the airport tenant airlines and increased traffic for maintenance work attracted by JD Aero Technical who established at the Airport in 2007 and expanded to a two hangar operation in 2012. Flight schools at Sault College Aviation, Soo Aviation, and Eagle Feather Aviation also played a significant role in the increased activity. In the last two years safety and facility improvements have been added to the terminal in the form of upgraded customer waiting and security lounges, energy efficient lighting, and a new state of the art H/Vac system. In partnership with all levels of government, expenditures in the range of $3.5 Million have been invested in these new improvements. Beyond the terminal improvements, major infrastructure expenditures were directed to improving the airport’s water and waste treatment plants, exterior LED lighting, and new construction of an airport hangar adding to JD Aero’s capability of servicing major airlines with over 50,000 square feet of enclosed hangar facilities. This amounted to over $5.1 Million in expenditures. The retreat provided an opportunity for the board to review these accomplishments and explore ways to further enhance the airport’s ability in meeting its challenges. "Furthermore the strategy session provided an excellent opportunity to appreciate the accomplishments of successes, the areas that need improvement and setting in place the tools to implement a doable strategic plan for continued success. Not satisfied with the norm, the Corporation is committed to working closely with the community, employees, and tenant family focused on customer satisfaction and being mindful of the needs of Sault Ste. Marie and area residents,” said Airport CEO Terry Bos. Upon completion of the strategic plan document it will be posted on the Airport’s web site. Pictured from left to right are Jim Bresnahan, business operations supervisor; Dan Lewis, vice chair; Tyler Wilson, director; Terry Bos, CEO; Gino Cavallo, director; Paul Ouimet, intervistas; Joe Krmpotich, director; Allan Frederick, secretary-treasurer; Jim DeGasparro, operations supervisor; Gene Nori, director; and Pelham Matthews, director. Absent from the photo due to other commitments Jerry Dolcetti, chair; and Doug Lawson, director.